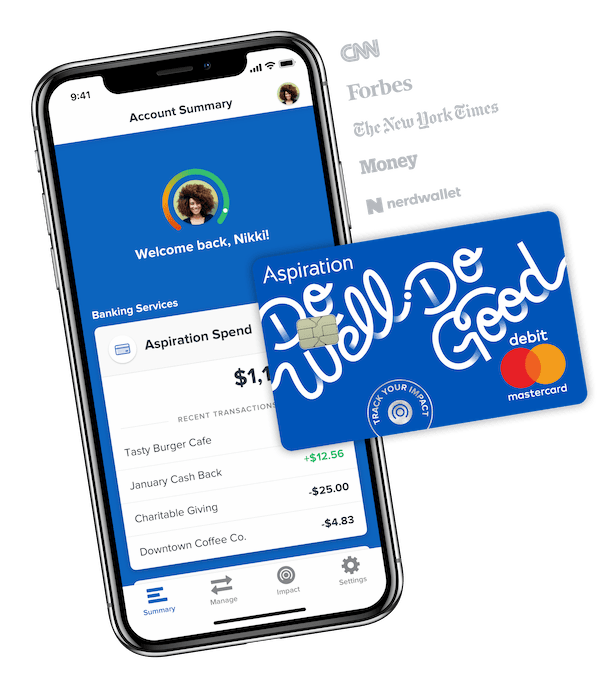 With Aspiration Spend & Save™, get the world’s first cash back account that lets you track the impact of your spending - all managed through one intuitive app. This testimonial may not be representative of the experience of other customers, and is no guarantee of future performance or success. What is Spend & Save™? At Aspiration, we always put our customers first. You can be sure because we trust you to Pay What Is Fair - even if it means zero. That means we will always be working our hardest for you. in 7 to 10 business days. Start saving more and spending smarter. It’s like a carbon footprint—for your cash. See how the companies you spend with score on their treatment of employees and the environment, every time you log in to your account. Earn extra cash back rewards for shopping smarter! Now there’s a new way. At Aspiration, your deposits will never go towards funding fossil fuel projects, firearms, or political campaigns. Visit the Questions & Answers page! ✝︎ The Aspiration Spend Account and the Aspiration Save Account are part of a cash management account offering of Aspiration Financial, LLC (“Aspiration”), an SEC-registered broker dealer. After the close of business each business day, the cash balances in the Aspiration Spend and Save Accounts are swept to an account at one or more federally insured depository institutions (each a “Bank”). The deposits at the Banks are eligible for insurance by the Federal Deposit Insurance Corporation (FDIC), subject to FDIC insurance coverage limits. For more information about FDIC insurance coverage, please visit the FDIC website. As stated in the Aspiration Financial, LLC Customer Account Agreement (Customer Account Agreement), customers are responsible for monitoring their total assets at the Bank to determine the extent of available FDIC insurance. FDIC insurance coverage is in accordance with applicable law and regulations, including the FDIC’s laws and regulations relating to “pass-through” federal deposit insurance treatment. The names of the current Banks that maintain the Aspiration Spend and Save Accounts are made available within your periodic statements and may vary over time. Deposits at the Banks are not eligible for SIPC coverage. Aspiration Spend is a non-interest bearing account with electronic transaction functionality. Aspiration Save is an interest-bearing account. Full disclosure about Aspiration Spend and Aspiration Save is available in the Spend & Save Supplement to the Customer Account Agreement. Investments placed in the Redwood or Flagship Funds available through Aspiration are not eligible for FDIC Insurance, are not bank guaranteed and may lose value. 1Banking on Climate Change: Fossil Fuel Finance Report Card 2018, by Rainforest Action Network, BankTrack, Sierra Club, Oil Change International, Indigenous Environmental Network and Honor the Earth. The Annual Percentage Yield (“APY”) associated with the Aspiration Spend & Save Account is variable and accurate as of 4/19/2019. Rates may be changed from time to time without notice. To earn 2.00% APY on Aspiration Save Account balances in any calendar month, a deposit of at least $1 in that calendar month into any Aspiration cash management account banking or investment account, or a single end of day Aspiration Save Account balance of $10,000 or more during the calendar month is required. If neither of these is met, the APY will be 0.00% for that calendar month. Minimum deposit required to open an Aspiration Save Account is $10.00. Pay What Is Fair fees debited directly from the Aspiration Save Account could reduce earnings. For more information click here. Customers will earn Cash Back on all debit card purchases. Customers may also earn additional Cash Back for purchase made at selected merchants. Cash Back percentages are subject to change at any time without notice. Cash Back will be credited to customer’s Aspiration Spend Account once at the end of each calendar month. Aspiration reserves the right to reverse Cash Back transactions under certain circumstances and the right to terminate a customer’s Cash Back feature for any abuse of the feature. This Cash Back reward program is subject to change by Aspiration at any time without notice. For more information, click here. Aspiration Financial, LLC is an SEC-registered broker-dealer and member FINRA/SIPC. Aspiration Financial provides brokerage services and securities products. Its affiliate company, Aspiration Fund Adviser, LLC, an SEC-registered investment adviser, provides investment advisory services. Aspiration Fund Adviser, LLC and Aspiration Financial, LLC are subsidiaries of Aspiration Partners, Inc. Neither Aspiration Partners, Inc. nor any of its subsidiaries is a bank. Aspiration pledges to donate 10% of our profits to charities. "Big Banks" refers to the largest consumer depository banks in the country. Securities purchased through your Aspiration Spend & Save Account are not FDIC-insured and are not bank-guaranteed, but are eligible for protection by SIPC, subject to the rules of SIPC. Investing in securities involves risk, including the possible loss of principal, and there is no guarantee that any investment will achieve its objectives, generate profits, or avoid losses. Before investing, consider your investment objectives. Aspiration Financial does not provide investment, financial, tax, or legal advice. Accounts and services are subject to the terms and conditions set forth in Aspiration Financial's Customer Account Agreement or as set forth on this website and updated from time to time by Aspiration Financial. Accounts must be approved by Aspiration Financial and fully funded before brokerage or cash management services are provided. This site is designed for U.S. persons only. This is not an offer or solicitation in any jurisdiction where Aspiration Financial is not authorized to do business or where such offer or solicitation would be contrary to the local laws and regulations of that jurisdiction. System availability and account access times may vary due to a range of factors, including, market conditions, trading volumes, system performance, and other factors. All ATM withdrawal fees will be waived for your Aspiration Spend & Save Account. In addition, your account will automatically be reimbursed for all ATM fees charged by other institutions while using an Aspiration Debit Card linked to your account at any ATM. The reimbursement will be credited to the account within 2 business days of the ATM fee debit. Please note, there is a foreign transaction fee of one percent that is not waived, which will be included in the amount charged to your account. Aspiration Debit Card is issued by Coastal Community Bank, Member FDIC, pursuant to a license by Mastercard International Incorporated. Mastercard is a registered trademark, and the circles design is a trademark of Mastercard International Incorporated. Aspiration Partners, Inc. and its affiliates are committed to "All Extra Services Provided at Cost", meaning that we'll only charge you what it costs us to provide the extra service (such as a wire transfer), and not a penny more. Besides these at-cost service charges, the only account fee you pay is the fee you choose, even if it’s $0, which is why we call it Pay What Is Fair. Aspiration Partners, Inc. previously had a partnership with Radius Bank, Member FDIC, which offered the Aspiration Summit Checking Account. If you had a Summit Checking Account with Radius Bank and did not close that account and open a new Aspiration Summit Account or a new Aspiration Spend & Save Account, please contact Radius Bank for more information on your account. © Copyright 2019 Aspiration Partners, Inc.